The October Horrorshow has been a little thin on zombie flicks this year. This is only the third zombie flick that’s made the cut (four if one were to count Resident Evil: Retribution, and I do not). This is also the best of the bunch. World War Z is a big budget adaptation of the bestselling novel by Max Brooks. I read the novel this past year. It was a page-turner, but the prose was off. A fictionalized oral history, the characters in the novel didn’t speak in colloquialisms, like normal people. They spoke with the written word. That is, the dialogue was very obviously composed, unnatural. It’s a subtle difference, but one that can determine whether a novel is well written or merely readable. So there’s a quick review of the novel, but how does the film hold up? Rather than follow the format of the novel, the film abandons the oral history aspect and the large cast of characters. It also expunges any familiar story from the novel. The film is a total whitewash, World War Z in name only, and that is a good thing. The film does a certain amount of jumping from location to location, but not nearly as much as the novel. It also focuses on a single main character, rather than being a pastiche of the experiences of many, and chooses to stick to the early days of a worldwide zombie outbreak, instead of spreading the action over months and years. Despite this preening, World War Z is still a big story. After a sorely overused news footage montage during the credits, the film opens in Philadelphia, where Gerry Lane (Brad Pitt) and family are downtown when the outbreak reaches them. There was little time wasted in getting things moving in this film. Character development consists of some quick throwaway lines that have little context, and mere minutes later, people are getting gnawed on. This doesn’t seem to matter, though. Besides, we’re not watching the flick for Gerry Freaking Lane. We’re watching it for zombies. It hardly even matters that it’s Brad Pitt in the lead. Anyway, it turns out Pitt is a bit of a go-to guy at the United Nations, and he’s called back into service to travel around the world and figure out where the zombie plague originated, in the hopes of finding a cure. Goodbye Philadelphia, hello darkened, rainy set pretending to be an airfield in South Korea. From there it’s on to Jerusalem, where the film reaches its frenetic peak, in a lengthy sequence where the hordes invade the city. And what hordes they are. Zombies come in all types of flavors. Runners, shufflers, flesh-eaters, and even picky eaters that prefer only brains, thank you very much. In some films they can be killed by shooting them in the head, while some just can’t be gotten rid of without burning them down to cinders. The zombies of World War Z are runners, but director Marc Forster and crew ratcheted up the speed, to the point that the majority of zombies in the film are CGI, for the simple reason that it would be impossible to find real people that can move like this. Therein lies a bit of a plot hole. These zombies are so fast, so aggressive, so relentless, and so numerous, that I can’t see how, if they were real, there would be any hope for civilization. The filmmakers painted themselves into a bit of a corner. But, that’s why I love fiction. Done correctly, a film can get away with anything. 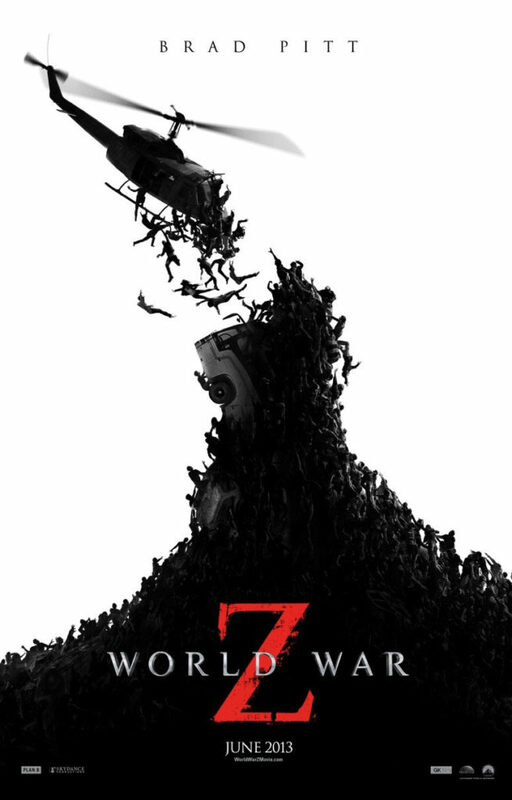 World War Z is a zombie film that embraces spectacle. It’s a big budget blockbuster with a slightly higher IQ than I’ve come to expect from splashy summer fare. In other words, I didn’t feel like the producers thought the audience was stupid. Man, I hate it when a summer blockbuster thinks anyone who watches it is a moron who can easily be hypnotized by explosions and overdramatic storylines into forking over their cash (I’m looking at you, Avengers). World War Z isn’t innocent of this, to be sure. But at least I didn’t feel insulted when I watched it. To get back to my earlier question, the film holds up well. World War Z is the rare film that is a nice compliment to the book. It sets itself up for a sequel at the end, because Hollywood, and I wouldn’t mind seeing another. It has the Inception ‘bong,’ though. Please stop with that, Hollywood.